The United States has exempted India from the imposition of certain sanctions for the development of the strategically-located Chabahar Port in Iran, along with the construction of the railway line connecting it with Afghanistan, a State Department spokesperson said. The decision by the Trump administration, which a day earlier imposed the toughest ever sanctions on Iran and is very restrictive in giving exemptions, is seen as a recognition by Washington of India's major role in the development of the port on the Gulf of Oman, which is of immense strategic importance for the reconstruction of war-torn Afghanistan. "After extensive consideration, the Secretary (of State) has provided for an exception from imposition of certain sanctions under the Iran Freedom and Counter-Proliferation Act of 2012, with respect to the development of Chabahar Port, construction of an associated railway and for shipment of non-sanctionable goods through the port for Afghanistan's use, as well as the country's continued imports of Iranian petroleum products," a State Department spokesperson told PTI. The US on Monday imposed "the toughest ever" sanctions on a defiant Iran aimed at altering the Iranian regime's "behaviour". The sanctions cover Iran's banking and energy sectors and reinstate penalties for countries and companies in Europe, Asia and elsewhere that do not halt Iranian oil imports. However, Secretary of State Mike Pompeo said that eight countries, India, China, Italy, Greece, Japan, South Korea, Taiwan and Turkey were temporarily allowed to continue buying Iranian oil as they showed "significant reduction" in oil purchase from the Persian Gulf country. 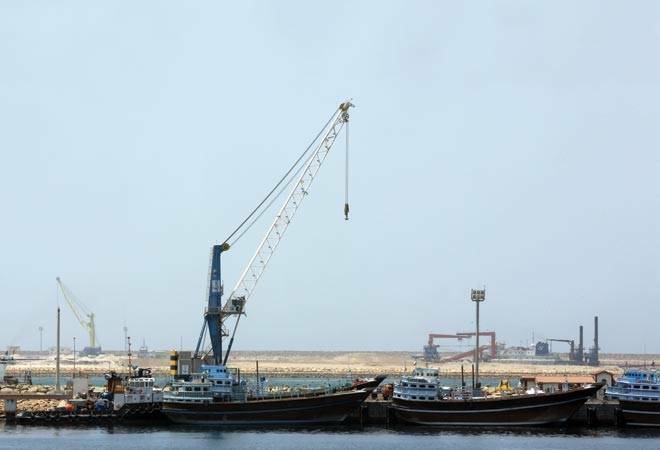 To a question on the fate of Chabahar Port after the US reimposed all its sanctions on Iran, the spokesperson said, "This exception relates to reconstruction assistance and economic development for Afghanistan. These activities are vital for the ongoing support of Afghanistan's growth and humanitarian relief." In May 2016, India, Iran and Afghanistan inked a pact which entailed the establishment of Transit and Transport Corridor among the three countries using Chabahar Port as one of the regional hubs for sea transportation in Iran, besides multi-modal transport of goods and passengers across the three nations. The port in the Sistan-Balochistan province on the energy-rich nations southern coast is easily accessible from India's western coast and is increasingly seen as a counter to Pakistan's Gwadar Port, which is being developed with Chinese investment and is located at distance of around 80 km from Chabahar. The Chabahar Port is considered a gateway to golden opportunities for trade by India, Iran and Afghanistan with central Asian countries besides ramping up trade among the three countries after Pakistan denied transit access to India. Pompeo's decision to give India an exemption from the imposition of certain sanctions for the development of the port is driven by the South Asian strategy, which was announced by President Donald Trump in August. It states that India has a major role in bringing peace and development in Afghanistan. "The president's South Asia strategy underscores our ongoing support of Afghanistan's economic growth and development as well as our close partnership with India," the state department spokesperson said. "We seek to build on our close relationships with both the countries as we execute a policy of maximum pressure to change the Iranian regime's destabilising policies in the region and beyond," the spokesperson added. Reacting to the Trump administration's decision, US experts said it was a "right move". "Trump administration made the right move by exempting India for the development of the Chabahar port," Jeff Smith of the Heritage Foundation told PTI. India, Smith argued, "made a convincing case" that its principal interest in the port was to develop alternative infrastructure links to Afghanistan that bypass Pakistan, which also serves the US national security interests. "Delhi also made clear that it does not support Iran's destabilising activities in the Middle East or an Iranian nuclear weapons program, and that any involvement in Chabahar will not advance those two agenda," he said. Smith said, Delhi credibly argued that if it were to abandon development efforts at Chabahar, the void would most likely be filled by others, including China. "Combined with the importance, this administration places on developing good ties with India, there was a compelling geopolitical case to be made for a waiver," he said. Aparna Pande of Houston Institute think-tank said that to give an exemption to India's development of Chabahar port was a welcome decision that comes on the heels of the US granting India, along with a few others, a waiver and temporarily allowing these countries to import oil in reduced quantities from Iran. "Both these decisions demonstrate that the Trump administration values the deep strategic relationship with India. It understands India's national security interests. Where Chabahar is critical to India's access to and assistance towards ensuring a stable Afghanistan, India's energy needs require a basket of energy suppliers," Pande said. Rick Rossow of the Center for Strategic and International Studies said, "Chabahar's role to transport key logistics to Afghanistan will continue to grow over time. So this waiver is squarely aligned with the US interests," he said.